This weekend across the world, including much of Latin America and the Caribbean (LAC), people will be joining NGOs and community groups in events designed to clean up beaches, coastal waters, rivers, lakes, parks, reserves and their surroundings as part of the annual Clean Up the World Weekend. Copied below is the official press release from the event’s global co-sponsors. To get the list of the organizers in LAC nations and how to contact them, click here to download the PDF file. Looking over the list, I’m pleased that LAC is well represented. But I’m also dismayed that once again there are important places that are conspicuous by their absence. Why, given their many beaches, the importance of tourism to their economies, and their trash problems, do I not see Barbados, Costa Rica, Jamaica or the Dominican Republic in this list??? (even poor, ravaged Haiti is on the list, but not its richer neighbor, the DR! For shame!). Why are Cancun, Cabo San Lucas, Acapulco, Fortaleza, Recife and Punta del Este missing??? Where are Antigua, Belize, the Caymen Islands, Dominica, St. Lucia? Why are only some, but not all, of the LAC national capitals on that list? Shouldn’t Mexico City, Asunción, Montevideo, Santiago de Chile, San Juan (Costa Rica), San Salvador, Quito, Bridgetown and Georgetown be there? Community-based action on climate change involving an estimated 35 million people across the planet in 2007 will culminate in the Clean Up the World Weekend on 14-16 September. More than 650 non-government organisations, community groups, local councils and other agencies in 115 countries are currently working on projects in 2007 to improve the health of the environment. The focus of many community activities around the world has been on limiting the impacts of climate change though activities such as waste reduction and recycling, water and energy conservation, and revegetation. On Clean Up the World Weekend, organisations will engage volunteers to take part in activities designed to clean up, fix up and conserve their local environment. The Australian founder and chairman of Clean Up the World, Ian Kiernan said communities in many countries are demonstrating that simple actions can make a real and lasting difference. “Millions of people simply conserving water, and recycling waste adds up to a huge environmental benefit for the planet. Among those undertaking activities as part of the weekend, Our Earth Foundation in Poland and the Tonga Solid Waste Management Project in the Pacific are conducting nationwide clean ups and Programa TV Na Praia in Brazil is coordinating a day of activities to launch their anti-litter campaign. The Clean Up the World campaign is in its 15th year and has the support of the United Nation’s Environment Programme (UNEP). 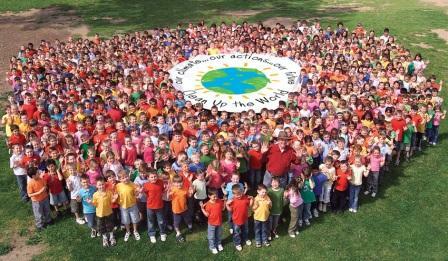 The 2007 theme ‘Our Climate, Our Actions, Our Future’ channels community action towards addressing the causes of climate change. Achim Steiner, Executive Director of UNEP praised the efforts of organisations across the world that are involved in Clean Up the World. “Climate change and other environmental challenges impact every corner and community on the planet. Our generation is witnessing the early stirrings of extreme weather events, melting ice and other climatic manifestations, and it is truly impressive to see so many communities responding to the challenge with grassroots enthusiasm and commitment. In this context, Clean Up the World is playing a leadership role by providing practical action and this is exactly how the world will start making a difference”, he said.